Minami Ito sat on the roof, lying flat on her back. She had come up there to escape the noise inside the school... and to sleep. How was she supposed to sleep down there when there was so much noise? She needed a quiet place where no one would disturb her. She closed her eyes and hummed a tune. She always found that humming helped her fall asleep faster. Baxcel walked across the roof. He saw a blue haired girl sleeping. "Why hello there. I'm Baxcel Senetaylor. Member of Utauloid," he said kneeling over her. Minami stopped humming and cracked open one eye. She looked up at the boy, then opened her other eye. She just looked up at him with big blue eyes and blinked slowly. "I'm... Minami Ito. 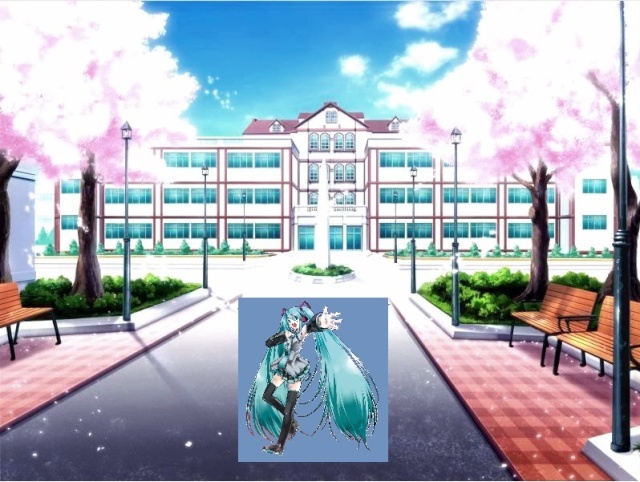 Member of Vocaloid," she introduced herself softly. Baxcel smiled a little. "What brings you up here?" he asked, "Aren't you a bit lonely?" Minami didn't smile or show any emotion. She didn't feel the need to. "I'm not lonely. I came up here for some peace and quiet." She paused. "Even if I were down there with all those people, I wouldn't be talking or anything. I don't talk much," she told him. She didn't say anything more than that. Xden walked across the roof. "Baxcel, leave her alone. If she wants peace and quiet, you should leave Baxcel," he said sweetly. He smiled at Minami. Maxs sighed as she put down her book. "Can you guys please be quiet. I'm trying to read. I always come up here to read in peace and quiet," she sighed shaking her head. Minami huffed and closed her eyes again. "So much for peace and quiet," she mumbled to herself. "I guess I won't be getting my nap today." Maxs glanced over at Minami. "I'm Maxs Isharino. 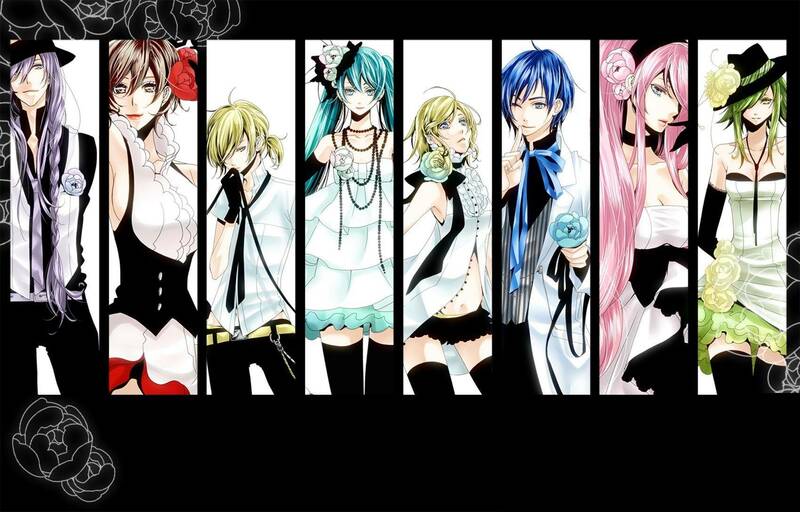 Member of Vocaloid. You're Minami right? These two boys are friends of mine. At least Xden is Baxcel doesn't really get along with anyone. Don't get him mad. Sorry to bother you," she said. Baxcel glared at Maxs angrily. "You have issues with people who call you short or emo!" he said tauntingly. Xden smiled at Minami. "I'm Xden Edemoman. Member of Vocaloid understudies!" he said cheerfully. Minami didn't open her eyes. She said simply, "We all have issues, Baxcel. It isn't nice to point them out." She didn't mean to sound as serious and emotionless as she did. She couldn't help that that was the way she sounded. Baxcel stared at Minami. "Oh really now. Does that mean you have issues making friends?" he laughed evilly. "Yes. Why do you think I came up here alone?" she replied calmly. "Loner. You are a loner, but you aren't the only one. These other guys are too," said Baxcel. Minami sat up and looked at him. "And what about you? Are you saying you have tons of friends?" Baxcel growled angrily. "OF COURSE I HAVE PLENTY OF FRIENDS!" he yelled. Maxs sighed shaking her head. "Baxcel, you need to cool down. Minami didn't do anything to hurt you. You should leave her alone," she said. Minami shook her head at Maxs. "No, it's okay. He can yell at me." She folded her hands in her lap and looked up at the sky.